It leaves me with lots of dress-trying. Which, really, if you think about it, isn't that bad. I don't spend any money. I get to shop. I get to play dress-up. I get to pretend. I get to gag. I get to laugh. And every so often I get to consider. I've tried on three that aren't terrible. But one of them only came in dark brown, so let's say two. And really, if I had to get one of those, it wouldn't be the worst thing that ever happened. I'd have to say that the wedding dress shopping is my favourite part of the whole wedding planning fiasco. Good thing that I have much more of it ahead of me! I like how you just called your wedding planning a "fiasco". love it! "aren't terrible" is NO GOOD! 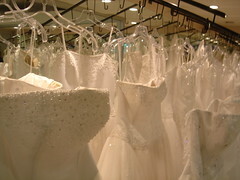 You must love your wedding dress and feel totally you in it. What kind of style are you looking for? I might be able to cull some of my resources from my brief time as a fashion journalist. I've got a couple of ideas on styles, but generally, it should be empire waisted, tight around my waist and then long, maybe some manner of rouching around hips area, assymetrically as this is the large area OR material that skims the hips and sticks relatively close to my legs. No big skirts - they look terrible. Halter is good, v-neck is also good (with deep v) or strapless if it's a corset-style. Thus far, the dresses I've liked have been bridesmaid's dresses that I could get made in white. I've only tried them once, so I can't remember how they look. But I liked them. And they were only ~$200. I like this tool on the Kleinfeld's page (yes, I am addicted to Say Yes to the Dress!) because you can select the style pieces and it gives you dress options. They may not be in your price range but it gives you designers you might like based on your preferences. If that helps! oooh, good call Raye! I haven't been dress shopping again yet. Still trying to get a venue nailed down. I'm SO itching to go. It's like a reward structure: if I do enough boring venue research, I can go try on dresses again! well, since I am moving to Toronto in a week .. I hope I can enjoy some dress shopping with you at some point. I love stuff like that! !